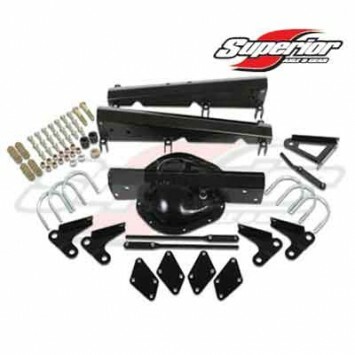 Closeout on Rear Axle Trusses from Superior for TJ/YJ model 35 and D44. Thread: Closeout on Rear Axle Trusses from Superior for TJ/YJ model 35 and D44. Yup closing these out for $365.00 shipped in the lower 48 US (CA residents add $27.38 sales tax). While supplies last. Approximately (20) of each. So hurry and get yours today. Now accepting PayPal as well. Superior Axle and Gear's Super 35 or 44 rear axle trusses are an easy way to keep your Dana 35 or Dana 44 from breaking, without breaking the bank! They feature mild steel construction that provides the added strength and stability you need for extreme off-road maneuvering, without any of the flexing and twisting you'll get with a stock axle housing. Their 3-piece design includes shock relocators with track bar adjustment and an integrated differential cover with fill and drain ports. Installation hardware is included and they bolt on without welding. When you order, PM me your name, billing and shipping address, phone number, email address (for PDF receipt). I will call you for CC info. Thank you very much. I am truly grateful for your business. When replying please include all previous messages in PM (keeps a running conversation). Re: Closeout on Rear Axle Trusses from Superior for TJ/YJ model 35 and D44. Another one gone today! Get yours on the way. New lower than low price of $269.95 shipped. CA sales tax of $17.62 if you are in this state. All the D35s are gone. Only the EV44TR-TJ products are left. While supplies last. So hurry and get yours today. 14 x EV44tr-TJ - PM or click here to order.